Work is starting on site and we look forward to seeing the redevelopment of this landmark building on Kensington High Street progress. 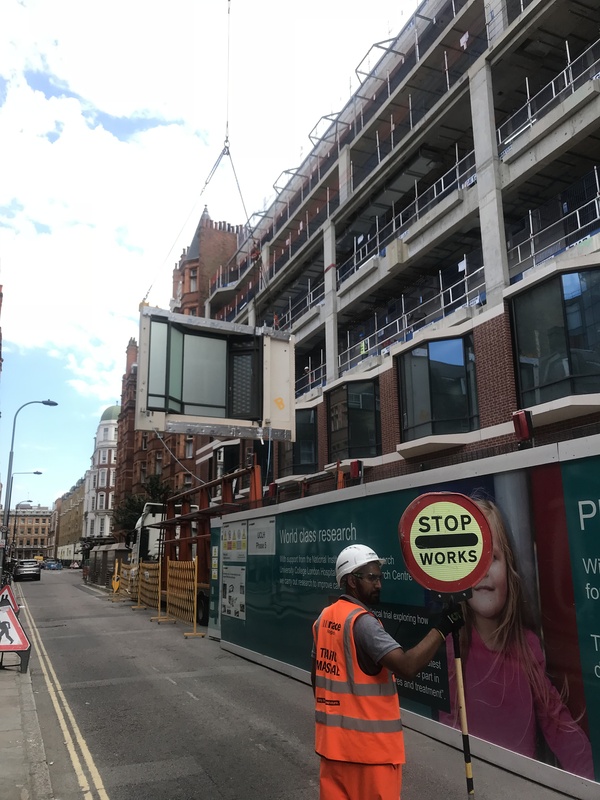 In picture: Modular construction for UCLH Phase 5, the new ENT and Dental Hospital in Bloomsbury. At a design charette organised by Architecture Today, together with five other practices, we explored the representation of sound in architecture. Fred Pilbrow presented our Theatre Acoustics Design Study, drawing on his recent experience with various auditoria to suggest that the “unhealthy passion for data” can all too easily override more significant aspects in their design. World Architecture Festival (WAF) is kicking off tomorrow and will be held in Amsterdam this year. Keb Garavito Bruhn will be judging the Small Scale Housing Category and with four of our own projects shortlisted in different categories, Keb will be joined at the festival by Fred Pilbrow and Gareth Wilkins to present our projects in front of the juries. We're looking forward to it. If you are around, please let us know! We hope to see you there. Proud that our project Walthamstow EMD Cinema has won the American Architecture Masterprize in the category Heritage architecture! We are pleased to present Fred Pilbrow’s artwork for donation to Article 25’s yearly flagship fundraising event 10x10. The 10×10 theme this year focuses on London’s largest contemporary infrastructure project – the Elizabeth line. Canary Wharf's plans for Wood Wharf have been revealed. Fantastic to be part of this great development with our design of The Market Building - a centre piece of this new urban district. Great to see our concept for the shed of the future published in Property Week. Journalist Stephen Cousins investigates the BIM modelling involved with the construction of UCLH's new ENT and Dental hospital in Bloomsbury. Read the full case study. We look back at a great party yesterday. Thanks to all joining us celebrating our 5th year anniversary. Fantastic results yesterday as The Waterman won the Planning Award in the category 'Best Housing Scheme'. We are also very pleased our other shortlisted projects Walthamstow EMD Cinema and Tileyard Studios are highly commended in the categories ‘Best Use of Arts Culture or Sport in Placemaking' and 'Promoting Economic Growth’. As part of London Festival of Architecture, we are opening up our studio and welcoming you to an evening of drawing and delight. Come and visit us at our open evening, where there will be life drawing workshops, plenty of the practice’s work on display to check out, and a chance to learn about technology and cutting edge design. Please RSVP and let us know you're coming. We look forward to seeing you then! As part of CDW 2018: Advised by Kay Watson, Digital Curator, Serpentine Gallery, we will host a showcase for the latest in VR experience, featuring artists and architects working at the frontiers of what is possible in this exciting and burgeoning medium. A talk on Wednesday evening, chaired by Kay, will convey the magic of the virtual world, looking at future trends and opportunities. On Tuesday 15th May Pilbrow & Partners will be hosting the London Society's talk about how to save London's heritage. Rebecca Barrett, Principal Adviser of the London Heritage at Risk team at Historic England will highlight some of London’s most interesting and unusual sites at risk. Shortlisted for four Planning Awards! 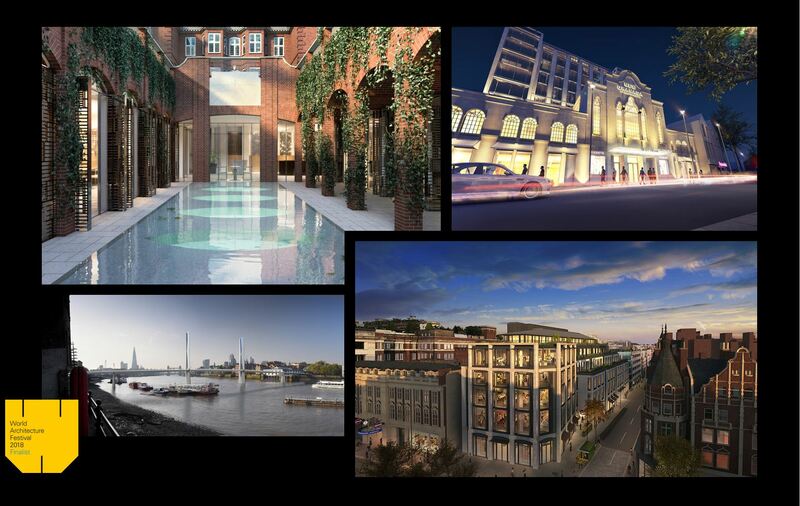 We're delighted to be shortlisted for four Planning Awards this year! Our proposals for the refurbishment of Walthamstow EMD Cinema have been shortlisted in two categories: ‘Best Use of Arts Culture or Sport in Placemaking' and 'Promoting Economic Growth’. In the latter category, the cinema will be competing with our shortlisted proposals for Tileyard Studios. ‘The Waterman’, our recently completed residential apartment building in Greenwich Peninsula is shortlisted in the category ‘Best Housing Scheme’. The winners will be announced 6th June. This week’s #buildingdoodle sketch in Building features our competition entry for the Old Street Iconic Gateway competition! Together with AKT II, Space Syntax, Future City and Motion Transportation, we suggest a unique public space for London: A state-of-the-art display screen forms the backdrop to an elevated piazza. Fred, Keb, Gorana, Rod and Neng will be attending MIPIM and would be delighted to meet you in Cannes. Are you around to meet up? Let us know, we'd love to hear from you! We look forward to be hosting LSA's next SHOW + TELL SOCIAL event on Monday 26 February. LSA's next Show + Tell Social considers design at the scale of the city. Bird’s Eye features architects and urbanists speaking about two specific examples of urban and infrastructure design. We hope to welcome you next Monday at our studio in Clerkenwell! The Waterman marks the first phase of the realisation of our masterplan for the east of the Greenwich Peninsula. Very pleased to see the project covered by AJ, Architecture Today and E-Architect! We are delighted our proposals for the “Old Street Iconic Gateway” are longlisted and being presented at a public exhibition, opening today. Together with AKT II, Space Syntax, Motion Transportation and Future City, we suggest a unique public space for London: A state-of-the-art display screen forms the backdrop to an elevated piazza. Visit the public exhibition and have your say. We would love to have your vote and look forward to hearing your feedback! Our proposals for Centre House, known as the former Ugli Campus on Wood Lane, will be presented tomorrow in a public consultation exhibition. The exhibition will be held between 3pm - 7pm at the Wood Lane Community Centre, 78 White City Close, London, W12 7DZ. We hope to see you there and we look forward to hearing your thoughts. We are pleased to be hosting the London School of Architecture’s new series of SHOW + TELL Social events. Please join and book you ticket for the first event of 2018 next Monday. We are proud our proposals for Alpha Square are shortlisted for a London Planning Award in the category for mixed use projects and we look forward to the ceremony tomorrow evening! The Royal Borough of Kensington and Chelsea (RBKC) has approved our plans for the renovation and remodelling of 127 Kensington High Street. The proposal remodels the bleak 1970s building to transform the quality of its architecture, its public realm and its internal working environment. They will also improve connectivity to Kensington High Street Underground station through the creation of a new retail arcade, linking to Wrights Lane. On 5 December, Matt Brown, editor at large of the Londonist and author of 'Everything You Know About London is Wrong', gave the Christmas talk to the Society members at our offices in St John’s Square. We were pleased to hosted this interesting and very well attended event. Read all about it here in Jo East's report. Catherine Jenkins, our Head of Planning & Creative Strategy, is joining the Architecture & Planning Panel, one of three panels undertaking design reviews for subscribing members including Transport for London (TfL) and the London Boroughs. Additionally, she will be sitting on the Royal Borough of Kingston Upon Thames Design Review Panel commissioned by Design South East. With the importance of design reviews highlighted in the Draft London Plan, Catherine now joins Fred Pilbrow (himself on the London Borough of Hammersmith & Fulham Design Review Panel) in being part of the London growing network of experts providing advice and support. Gorana is an architect and urban designer who specialises in masterplanning and strategic city-regional planning. She is passionate about cities and their development, particularly ways to boost economic prosperity, enhance public spaces and foster a creative, diverse and dynamic street life. We are in Berlin for the 10th edition of the World Architecture Festival. Fantastic to be the winner of a Future Projects Award with our proposals for a new Archaeological Museum in Cyprus! We are also very pleased to be highly commended with our designs for C2, the centre piece of Canary Wharf’s new Wood Wharf district. Great to see Fred Pilbrow's sketch for 8 Albert Embankment published by Building as this week’s #buildingdoodle sketch of the week! Pilbrow & Partners together with Space Syntax proposed ‘The Eye of the Needle’, a new pedestrian route through the 'Culture Mile'. The ideas were shortlisted in a competition to transform the City of London’s north-west corner into a new arts district. Twelve slender steel masts mark the route, like needles in a map. Distinctive in form – tapering triangular polished obelisks that sparkle in the day and glow softly at night – the masts would be eye-catching landmarks in their own right, as well helping to highlight hidden gems, interesting architecture, historical sites and cultural activities within Culture Mile. Pleased to be at MIPIM UK this week showcasing a selection of our projects at the London Stand. Fred Pilbrow was delighted to be part of the Opportunity East panel discussion, talking about the challenges but mainly the opportunities for growth that area has to offer. Delighted to announce two of our projects have been awarded The American Architecture Prize 2017. UCLH phase 5 has been selected by the jury as a winner in the Healthcare Architecture category, and our design for St Mary's Somerset Tower has been selected as a winner in the Heritage Architecture category. We are looking for highly talented and ambitious Graphic Designer to join our energetic team at our studio in Clerkenwell. This is an exciting opportunity to become a part of a rapidly expanding practice and help define its future successes. We look forward to hearing from you! As part of a lecture series, organised by Grohe, Fred Pilbrow was pleased to share and present his vision on how new technologies and resources are offering a great scope to further expand architects’ capabilities. We are looking for highly talented and ambitious Architectural Assistants (Part I / Part II) to join our energetic team at our studio in Clerkenwell. This is an exciting opportunity to become a part of a rapidly expanding practice and help define its future successes. We look forward to hearing from you! 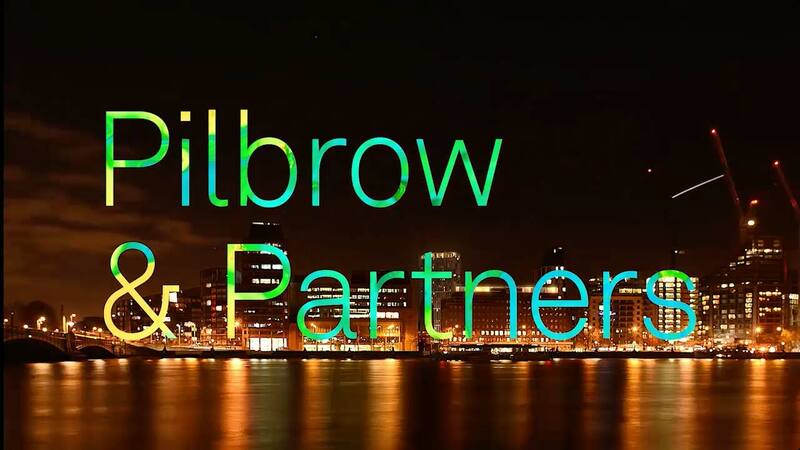 We established Pilbrow & Partners to develop an architectural design approach that fully integrates the latest available resources in technology, modelling and data. Great to see our article published by RIBA J, describing how the latest analytical techniques optimise our design solutions, allowing us to create better places to live and work. The Francis Crick Institute has won the Silver Jubilee Cup at the RTPI Awards 2017 in the category for Planning Excellence to Create Economically Successful Places. Following an invited competition in 2010, Fred Pilbrow led the team at PLP Architecture to collaborate with HOK on the design of The Francis Crick Institute, the new 855,750 ft² national centre for biomedical research adjacent to the Grade I listed St Pancras International Station. Keb Garavito Bruhn, founding partner of Pilbrow & Partners, is part of this years’ jury panel of the World Architecture News Awards, judging the Civic Buildings category. Our designs for the New Cyprus Archaeological Museum will be part of the London Design Capital exhibition, on display at the Building Centre from 12 May until the first week of July. Our senior partner Fred Pilbrow has been invited to the Yale School of Architecture in New Haven, Connecticut to deliver a series of classes. In February, our partner Sam Yousif presented to the New London Architecture Education Conference, discussing the subject of integrating schools and housing. In November 2016, Fred, Keb and Tal spent two days in the German capital in attendance at the World Architecture Festival, showcasing current and past projects.